60g/2oz goat cheese –the goat cheese needs to be plain and not too strong in flavor. 1/4c freeze dried cherries, make sure that they are freeze-dried cherries vs. cherries dried like a raisin. Also, it is important that they have no ingredients other than cherries. 1. Heat the oven to 350° F/177° C.
the oven as it is heating. 3. Prepare the cookie pan with cooking spray and parchment paper. 4. Cream together the butter and sugar in a stand mixer fitted with a paddle attachment. 5. Add in the egg, egg yolk, vanilla, and green food dye. 6. In another bowl, whisk together flour, salt, baking powder, baking soda, and cornstarch. 7. Add the dry ingredients to the wet ingredients. Mix until just incorporated. 8. Fold in the pistachios. 9. Spread the cookie mixture in to prepared pan. Press and smooth the batter with wet hands. 10. Bake for 15-20 minutes, until lightly browned. 11. Cool on wire rack for 5 minutes. 12. Press the cookies lightly with the smooth bottom of a drinking glass. 1. While the cookie layer is baking, combine cherries, 1/4c water, and sugar in a heavy bottomed saucepan. 2. Heat over medium-high heat while occasionally stirring and smash with a potato smasher. 3. While the mixture is warming, mix together the other 1/4c water with cornstarch. 4. Once the cherry mixture is warm, stir in the cornstarch mixture. 5. Cook until the jam is boiling and very thick. 6. Spread on a sheet pan and chill in the refrigerator. 7. After the cookie layer has been pressed, spread the chilled jam on top. 8. Chill the cookie and jam layers in the freezer. After ~15 minutes remove the cookies from the pan by lifting up on the parchment paper. 9. Continue to chill in the freezer. 1. While the cookie and jam layers are chilling, make the frosting. 2. Cream together the goat cheese and butter. 3. Add in the confectioners sugar. Mix until completely smooth. 4. Add in the vanilla extract. Thin the mixture as needed with heavy cream. 5. Spread the frosting on top of the chilled bars. 6. Chill again in the freezer until time to cut. 1. Remove the edges with a sharp chef's knife. 2. Using a ruler, measure precisely to cut 12 identical bars. 3. 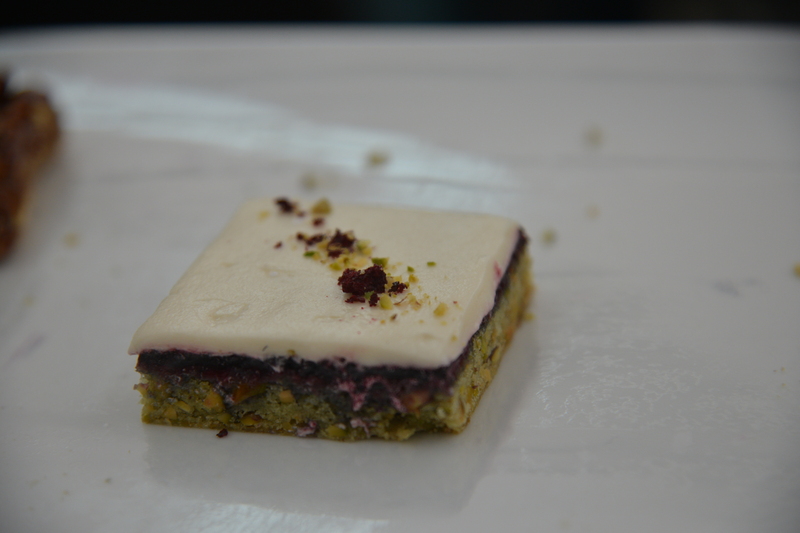 Sprinkle chopped pistachios and cherries diagonally in a line across each bar. 4. Move to serving tray.